Nodding ladies'-tresses (shown enlarged) are named for the way the flowers seem to be braided into the stem, like a lady's braid. The flowers "nod" or point slightly downward. Westborough's nodding ladies'-tresses grow on sandy, grassy lakeshores, like this one at Minuteman Park. As summer's flowers and foliage begin to fade in early September, colonies of small wild native orchids appear on some of Westborough's sandy lakeshores. These little orchids go by the name of nodding ladies'-tresses. The plant is named for the way its flowers appear to be braided into the stem, as in an old-fashioned lady's braid. The delicate white flowers are only about half an inch long. They point slightly downward, a position known as "nodding". Their nodding helps to prevent the flowers' all-important nectar from being diluted with water when it rains. Nodding ladies'-tresses (Spiranthes cernua) are wetland plants of sunny, grassy shorelines. They have narrow, grass-like leaves, and the flowers bloom on short spikes that stand 8- to 18-inches high. Westborough's nodding ladies'-tresses can usually be found on sandy, grassy lakeshores, but these orchids can also grow in wet meadows, roadside ditches, sunny bogs. They sometimes colonize recently disturbed areas, so they can even appear in places such as moist sand pits. Look for nodding ladies'-tresses in grassy areas along the shores of Sandra Pond, Lake Chauncy, Mill Pond, and old farm ponds. You'll find them at Minuteman Park in a couple of places along the short shrub-lined path at the far south end of the park (toward Upton). They usually grow at Lake Chauncy Beach near the fence along Chauncy Street, but the area has recently been mowed so they aren't there this year. The plants grow from fleshy roots, so they're likely to survive the mowing and come up there next year. Because of where they grow, mowing can be a hazard for nodding ladies'-tresses, but it can also be a benefit. By cutting back competing plants, regular mowing can prevent ladies'-tresses from being overgrown and shaded out. It all depends on the timing of the mowing. If you have an area on your property where nodding ladies'-tresses grow, it might be best to avoid mowing there after early August. The braided look of nodding ladies'-tresses comes about because two spirals of flowers coil around one another on the stalk. The flowering stalk's appearance has inspired another romantic name, pearl twist, as well as a very unromantic name, screw auger. Like many orchids, nodding ladies'-tresses have delicate-looking flowers that package their pollen in large sticky clumps. Instead of dusting their pollinators with pollen, as many other flowers do, nodding ladies'-tresses glue pollen clumps onto them. When bees or other pollinators check a flower for nectar, the pollen clumps stick to their mouths or tongues and stay there until they are scraped off in the next flower. Native Americans made a tea from the whole ladies'-tresses plant to treat urinary problems and venereal disease. They also made a wash from it to strengthen weak infants. People interested in gardening with native plants can find commercial varieties of ladies'-tresses for their autumn gardens. 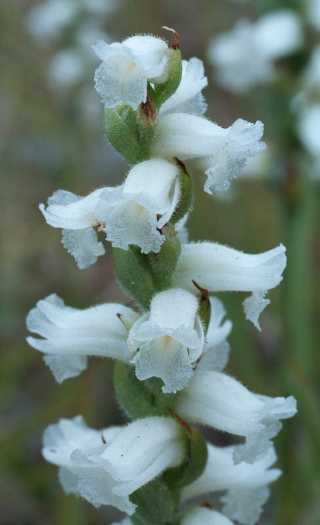 One commercial variety of nodding ladies'-tresses, called Spiranthes cernua odorata, Chadds Ford, is known for its fragrance. This variety descended from a plant that was rescued from a ditch on land that was about to be developed in Delaware. Nodding ladies'-tresses is one of three wild native orchids that we are fortunate to have growing in Westborough. The other two are pink lady's-slipper (Cypripedium acaule), which blooms in May, and downy rattlesnake-plantain (Goodyera pubescens), which blooms in early August. (See the Nature Notes columns of May 14, 2004 and August 5, 2005 for more information about these two). In the northeast we tend to think of orchids as rare and exotic because most are found in the tropics, but Massachusetts is home to at least 45 different kinds of orchid. At least 12 types of ladies'-tresses are native to the eastern U.S. The orchid family is actually one of the largest plant families, with about 20,000 species worldwide.